This week’s home video releases are anchored by another Middle Earth adventure from director Peter Jackson. When director Peter Jackson announced that his cinematic interpretation of J.R.R. Tolkien’s “The Hobbit” would be released in three parts, it sounded like a disaster in the making. “The Hobbit” is a lighter work than “The Lord of the Rings,” and the book could have easily been condensed to a single, three-hour movie. Two films into the trilogy, Jackson’s vision has been vindicated, as his “Hobbit” movies, particularly “The Desolation of Smaug,” are nearly as exciting and well-rendered as his “Rings” interpretations. Jackson maintains the serious tone that he set in the “Rings” films, and he takes pains to tie the events of the two trilogies together. The result is a continuing Middle Earth epic that should delight both Tolkien aficionados and newcomers alike. “The Desolation of Smaug” has an advantage over its predecessor – “An Unexpected Journey” – because the set up is already out of the way. That means more adventuring as the hobbit Bilbo Baggins accompanies a group of dwarves on a quest to reclaim their homeland and the immense riches it contains. The only trouble is they can only achieve their goal by vanquishing a mighty dragon that has slumbered for years. “Journey” was a solid introduction to the story, but “The Desolation of Smaug” is better in terms of pace and character development. By the time the film ends, viewers should be able to identify with Bilbo and have a greater understanding of the quest the characters are undertaking. They are also treated to a number of fantastic action sequences, as the dwarves face off against creatures ranging from trolls and giant spiders to evil Orc warriors. Unsurprisingly, the special effects are astonishing, but “The Desolation of Smaug” is about more than visuals. The story has an epic feel and the many connections to the “Rings” trilogy offers depth and intrigue for fans of that series. Jackson is a fine director, but he is prone to excess. Fortunately, he keeps this tendency in check for “Smaug,” delivering a film that moves briskly despite a run time of nearly three hours. Martin Freeman again impresses as Bilbo, an unlikely hero who surprises both his comrades and himself. The supporting cast is also strong, and “Rings” star Orlando Bloom gets considerable screen time, as his character – Legolas – plays a major role in the plotting. Of course, Ian McKellen is also back, reprising his excellent portrayal of the great wizard Gandalf. “The Desolation of Smaug” is a must-see for fans of fantasy and science fiction and it deserves strong consideration even from those who normally avoid the genre. Blu-ray and DVD extras include production videos, a music video and two behind-the-scenes features. Despite one of the finest casts assembled for any 2013 movie, director John Wells’ screen adaptation of the Pulitzer Prize-winning play “August: Oasage County” is a dull, slow-moving affair that mires in the grief of its depressing central characters. Because of the exceptional cast, and because the movie is as compressed as the play, these characters are well-drawn. That is a positive, but it does not make the movie pleasant or insightful. Rather, it is a two-hour melodrama built around the escapades of a dysfunctional Oklahoma family that gathers when their patriarch, Beverly Weston (Sam Shepard), goes missing. Viewers meet Beverly in the first scene, as he debriefs a new maid (Misty Upham) in astonishingly frank fashion. He tells the woman that his wife, Violet (Meryl Streep), is addicted to pills and that he drinks too much. He also notes that, as a retired poet, his only solace outside of booze is a cherished collection of books. In the next scene, Beverly has gone missing, prompting Violet to call her three grown daughters back home. The audience gets a brief introduction to each of the Weston girls, Barbara (Julia Roberts), Ivy (Julianne Nicholson) and Karen (Juliette Lewis), as well as Violet’s sister, Mattie (Margo Martindale) and her husband, Charlie (Chris Cooper). One need only read the actors’ names to realize how much talent is on display, and Streep and Roberts earned Oscar nominations for their work. It takes more than a great cast, however, to make a worthwhile film. Plays and movies are different creatures out of necessity, and Wells does too little to separate his film from its literary counterpart. 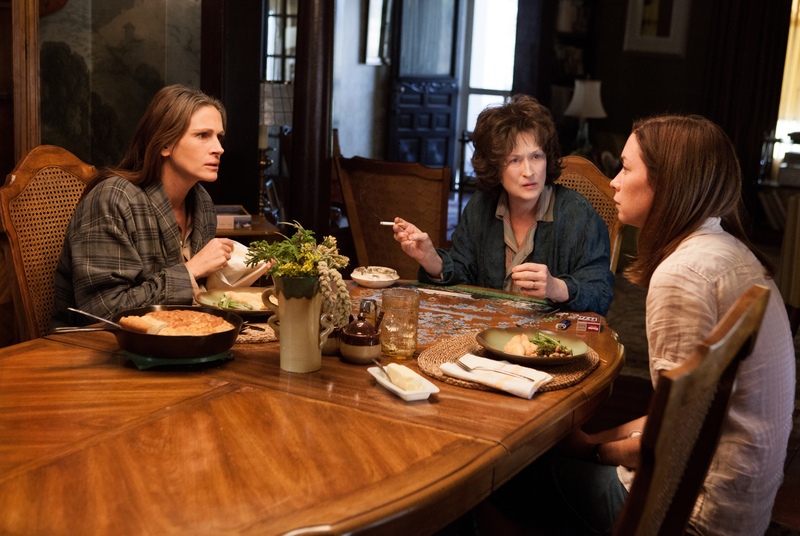 “August: Osage County” is talky and slow-moving, and the family drama is so extensive that it grows comical… in a bad way. There is plenty of drama in the story of a drug-addicted senior citizen pining for her missing, alcoholic husband. But each of the Weston siblings has considerable issues of their own. Barbara is having marital problems, Ivy is involved in a secret romantic relationship and Karen is engaged to a philandering businessman. For an hour, it’s interesting to watch these individual disasters collide. But the film runs two hours, leaving viewers with another 60 minutes of depressing, pessimistic drudgery. Playwright Tracy Letts adapted her own material for the screen, and she doesn’t have anything positive to say about family life or romantic relationships. This is an acceptable viewpoint, but not one that makes a particularly compelling movie. The cynicism grows tiresome even when great actors are doling it out. Blu-ray and DVD extras include deleted scenes and an audio commentary. What started as an inventive horror movie that proved creativity and hard work can trump massive studio budgets has devolved into a relentless cash grab. When the first “Paranormal Activity” movie made a splash in 2007, found-footage pictures were relatively rare. That, coupled with the genuine creepiness of the plot, made the movie’s lack of polish a benefit. Five movies into the franchise, a continued reliance on grainy, handheld video and relatively unknown actors seems like nothing more than a strategy to keep costs low. This is apparently working, as “Paranormal Activity: The Marked Ones” was reportedly made for $5 million, a tiny number for a modern, wide-release picture. The trouble, of course, is that the quality has declined accordingly. Movies claiming to be assembled from found video footage are no longer novel. That means, unless they are remarkably well done, they just look cheap. If “The Marked One” had a decent story, it might be worth looking beyond the annoyingly amateur cinematography, but it does not. The movie, written and directed by “Paranormal Activity 3” and “4” director Christopher Landon, is nothing more than a rehash of what’s come before. This time, the focus is on Jesse (Andrew Jacobs), an inner-city youth who begins to experience bizarre events after his strange downstairs neighbor (Gloria Sandoval) dies. Of course, he and his friends are enamored with a video camera, so all of the happenings are captured on tape. Landon ramps up the action, even adding a gun battle at one point. This does not, however, change the fact that this film is little different than its predecessors. If you’ve always wanted to see a 70-year-old Jake La Motta go toe-to-toe with a 60-something Rocky, “Grudge Match” is your dream come true. If you’d rather eat sandpaper than watch Hollywood seniors act out physically impossible feats, it’s your nightmare. The premise of “Grudge Match” is that two old rivals, Henry “Razor” Sharp (Sylvester Stallone) and Billy “The Kid” McDonnen (Robert De Niro) agree to a fight three decades after their last bout. Considering the physical demands that boxing place on the body, the premise is ludicrous. The attraction, of course, is that it pits De Niro (widely celebrated for his portrayal of La Motta in “Raging Bull”) against Stallone (the man who will always be remembered as “Rocky”). For viewers willing to set all reason aside, the movie has moments. Stallone and De Niro are appealing performers, and it is funny to watch them posturing as they prepare to fight one another. It is less enjoyable when they actually get in the ring for a brutal match that would leave much younger men physically exhausted. Is it possible that senior citizens could go the distance in a boxing ring? Perhaps. Is it possible that they would look as imposing and powerful as these two? No. But this is Hollywood. Movies like “Grudge Match” aren’t meant to be realistic. They’re meant to be fun, and the picture – directed by Peter Segal (“Get Smart”) – largely succeeds. Segel takes the ridiculous premise and runs with it, focusing not only on the forthcoming boxing match but on past issues that made the men adversaries outside the ring. Stallone’s and De Niro’s performances are bolstered by solid supporting turns from Alan Arkin (a retired trainer), Kim Basinger (Razer’s love interest) and Kevin Hart (a hungry promoter). The project is so lightweight and silly that it doesn’t make sense to examine it too thoroughly. It’s enough to say that the movie is more about sentimentality than common sense. For many viewers that will be just fine. Blu-ray and DVD extras include deleted scenes, an alternate ending, and an alternate opening. “Snake and Mongoose”: Drama about the longtime rivalry and friendship between professional drag racers Don “The Snake” Pudomme (Jesse Williams) and Tom “Mongoose” McEwen (Richard Blake). Directed and co-written by Wayne Holloway. “Cocaine Cowboys – Reloaded”: Expanded version of director Billy Corben’s 2006 documentary about the drug trade in Miami during the 1980s. “Best Night Ever”: Comedy about several women who head to Las Vegas for a bachelorette party only to have things get wildly out of control. Starring Desiree Hall, Samantha Colburn, Eddie Ritchard and Crista Flanagan. Written and directed by Jason Friedberg and Aaron Seltzer.